The iconic steam locomotive Flying Scotsman roared back onto the tracks today after a £4.2m restoration project. To cheers from huge crowds, the famous old engine arrived under its own steam at platform three of the East Lancashire Railway's station at Bolton Street in Bury. 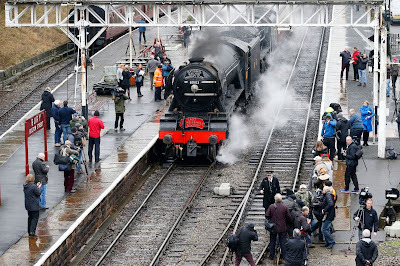 The triumphant arrival was the first time the Scotsman has been seen in public in more than a decade. Painted in its wartime black livery, the much-loved locomotive emerged from the work shed of Bury-based steam and diesel engineering specialists Riley & Son at around 10am and steamed into the station for the public unveiling at around 10.30am. Teams of engineers led by driver Ian Riley had been up for hours, preparing and lighting the engine’s huge boiler fire. Steam enthusiasts young and old lined the route to Bury and watched the arrival from bridges overlooking the station. From Bury, the Scotsman steamed to Heywood hauling a set of carriages and is set to return to Bury at around 12.30pm today, where it will stay for around 45 minutes for fans to take photographs. Thousands of spectators are expected to line the 12-mile railway route on Saturday and Sunday as track testing begins. The locomotive has been brought back to life after the National Railway Museum bought it for £2.3 million in 2004 before work got under way in 2006. Built in Doncaster, South Yorkshire, in 1923, the Scotsman soon became the star locomotive of the British railway system, pulling the first train to break the 100mph barrier in 1934. Last year it topped a poll of the world’s best-known trains and locomotives following a worldwide survey. Spectators spoke of witnessing a fascinating moment in history. Helen Giles, 61, grew up in Bury and is now living in Stockport. She travelled with her daughter Emma, 34, to watch the Scotsman arrive in Bury. Helen said: “I am very excited to be here to see the Flying Scotsman - it’s beautifully cleaned and done up. After the test runs, Flying Scotsman will return to the workshop to be transformed by Blackburn-based firm Heritage Painting into its British Rail green livery. That will be followed by mainline test runs. “These are the first stages of bringing it back to the mainline and despite being self-confessed men of iron, we’re really quite emotional to see it move under its own steam at last after years of hard work,” said Colin Green, co-director at Riley & Son. The government has said Flying Scotsman will become an educational museum exhibit. 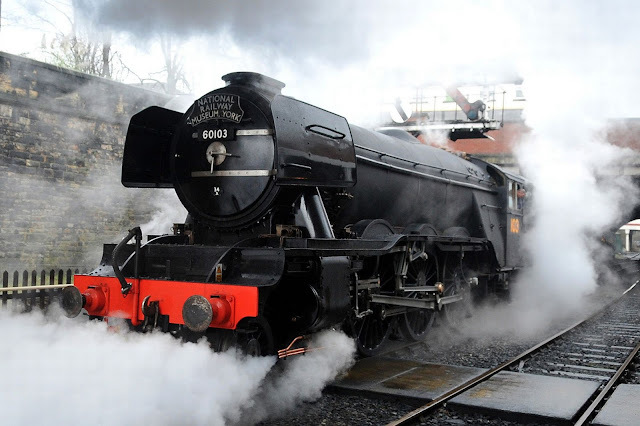 Heritage Minster, Tracey Crouch, said today: “From early 2016, the Scotsman will tour the UK as a working museum exhibit, educating fans of all ages about the wonders of the engineering behind its steam traction.